a product of Sea Turtle Scuba, Inc. This is a special page for the APAA - American Prinzmetal's Angina Association, Inc.
APAA is a not for profit association whose purpose is to foster awareness and research into the disease Prinzmetal's Angina, a debilitating and potentially deadly ailment that affects people of all ages. At this time, there is no known cure. We have donated this page to help APAA distribute their safety PILL SAFE to persons with heart disease who need to carry nitroglycerin tablets. It is also to help them raise money by accepting donations. 100% of the money donated on this page goes through Paypal directly to APAA. It does not go through our company. What you need to know about using nitroglycerin tablets. 1. You are probably paying too much for your tablets. Most pharmacies offer the tablets in two quantity configurations. You can get 100 tablets in one bottle for about $19.00 or you can get 100 tablets in the form of 4 little bottles with 25 tablets in each bottle. You need to carry tablets with you for potential emergency use. it is not practical to carry the 100 tablet bottle because the tablets get worn down from the movement during the carrying. You don't need more than a few tablets with you at a time for an individual angina attack because if you need more than 3 tablets you need to go to the emergency room. For this reason, most people buy the 4 pack of 25 tablets. The pharmacies charge on average about $45.00 for your 100 tablets when you get them in the 4 little bottles. That's more than $25.00 too much for the same 100 tablets. APAA has put together a pill safe for you to carry your small amount of emergency use tablets. It consists of a tiny glass bottle to hold a few tablets and a larger plastic container to carry the little bottle. It also contains a couple of blank labels to allow you to enter the expiration date of the tablets you put in the bottle. The idea is that you should purchase your tablets in the 100 tablet bottle size and then transfer just a few tablets at a time to the small bottle to carry with you for emergencies. You will save about $25 the first time you use it. 2. You should not carry your small bottle of emergency pills in your pocket. You body heat will ruin the effectiveness of the nitro. 3. You should not put your tablets into any container that is not glass. Plastic, aluminum or any other substance will ruin the effectiveness of the nitro. 4. You should not put cotton or other packing into your container. Coming in contact with any substance other than the glass bottle will ruin the effectiveness of the nitro. 5. Using the APAA Pill Safe. Purchase your nitroglycerin tablets in the 100 tablet bottle size. Transfer a few tablets into the small bottle that comes with your set. Transfer more as you need them. Don't open your small bottle except when adding or removing tablets. Humidity is not good for the tablets. If you ever notice that your little bottle does not appear perfectly clean, you can rinse it out with water and dry it completely before putting in more tablets. You can clean the inside with a Q-tip. Put a few tablets into the small bottle that comes with the pill safe. This is general information. Always follow the instructions of your physician. If his/her instructions seem to differ with what you see here, another good source of dependable information would be your pharmacist or the company that manufactured the pills. Their contact information will be on the package. 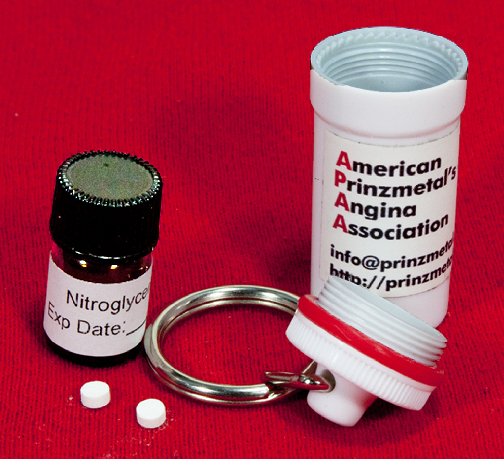 Nitroglycerin pills should not be removed from the original glass container and stored in another container. Nitroglycerin pills should be stored in the original bottle and the bottle kept tightly closed. If you want to protect your bottle of pills beyond the original bottle, we reccommend inserting the entire bottle into special containers that have been designed for that purpose. Do not place other medication in the nitroglycerin pills bottle. Nitroglycerin is an inherently unstable chemical. It is especially susceptible to loss of potency when exposed to heat, light or moisture. The bottle that your nitroglycerin pills came in complies with U.S. Pharmacopoeia guidance. Manufacturers of nitroglycerin sublingual pills use these types of bottles. That is why your pharmacist dispensed the product in its original container. With proper use and storage of the product in accordance with the manufacturer’s recommendations printed on the label and in the Package Insert, customers can expect acceptable product potency following routine opening and closing of the container up to the expiration date as shown on the nitroglycerin pill bottle. nitroglycerin pills should be discarded if it was improperly stored, or if the expiration date on the package has been exceeded. The product could be carried in a briefcase, pocketbook, tote bag, or overcoat. Some people wear a “fanny-pack” in order to keep the product with them at all times. We have containers that are specially designed to hold the 25 pill bottles. These containers can be worn as a pendant, or can clip onto something, such as a belt loop or key chain. You can get one free by making a donation. Take a look at it. Your pharmacist may carry these types of containers, but if they don’t, they generally have access to order them. Containers such as these are also available through this website. NEVER REMOVE THE nitroglycerin pills FROM THE ORIGINAL CONTAINER, UNLESS THE PILL IS BEING IMMEDIATELY USED. If you choose to use one of these described containers, always put the original nitroglycerin pill bottle, with the lid securely closed on the bottle, into the container. Never pour your nitroglycerin pills directly into one of these containers. Q My nitroglycerin pills aren’t working because I’m not getting a headache, or I’m not getting the tingling sensation under my tongue. Q Why isn’t there cotton in the bottle, or a safety seal or plastic shrink wrap around the lid of my nitroglycerin pill bottle? A There are several reasons why the bottles come without cotton, and no seal inside or outside the lid. 1. Nitroglycerin products are inherently unstable. They are especially susceptible to loss of potency when exposed to heat or light. Sealing a bottle or carton necessitates that heat be applied to the bottle or carton. This could affect the potency of the product. 2. Cotton, rayon, or any other material in the bottle could affect the stability of the nitroglycerin. This could affect the potency of the product. 3. Most importantly, unlike many other medications, nitroglycerin pills are used by patients who need to get to the product immediately. A person suffering an angina attack may not have time to remove a safety seal, or try to remove cotton from a very small opening, in order to get to the medicine.